Heating costs are a challenge for many of us, and Indian Country is no different. Heating costs are a challenge for many of us, and Indian Country is no different. In the late months of winter, many Native American Elders on fixed incomes struggle to stay warm. This is when NPRA Winter Fuel steps in, each year offering a cord of firewood or fuel vouchers. Through the NPRA program, we deliver firewood in the early fall, before the first cool weather hits. We provide winter fuel vouchers in February and March, when resources for heating assistance from tribes and other agencies have often been depleted for the year. 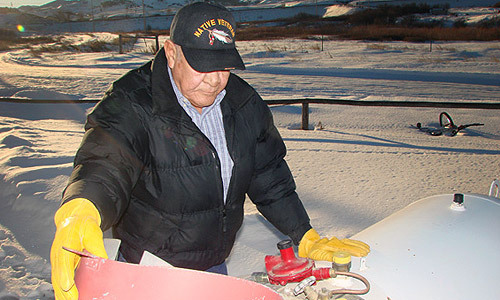 Each Elder may choose to use the voucher to pay for propane or electricity. 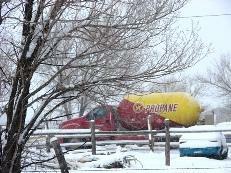 Every two years, NPRA brings the Winter Fuel service to a different reservation to avoid creating dependency. This is in keeping our vision of promoting self-sufficiency for Native Americans. We help show each tribe the value of outside resources and encourage them to seek alternative means of continuing the service when NPRA moves on to assist other reservations. Reservations on the Northern Plains can be bitterly cold and biting winds regularly gust up to 50 mph. Under such conditions, exposed flesh can freeze in less than a minute. When money for fuel has run out, residents have been known to burn clothing or furniture, or hang blankets at the door and stay in one room, in anxious attempts to stay warm. Or they may have to make the difficult choice of buying winter fuel or food. Each Elder may choose to use the voucher to pay for propane or electricity. The Winter Fuel service helps our Program Partners assist Elders at risk of going without heat during the long Northern Plains winter.